A follower recently asked me what was actually bad about GMO’s besides the fact that they’re unnatural. It was a good question! I wrote about this subject January 23rd and 24th. https://mycookinglife.com/2012/01/24/a-bandwagon-worth-jumping-on/ and https://mycookinglife.com/2012/01/23/whats-good-enough-to-eat/ I’ve continued reading about this subject and have come to understand that it is not just a problem of having a fruit, vegetable or animal’s genes modified in order to develop some quality or characteristic that it wouldn’t normally have. (Though for me, this is unnatural enough and reason enough for me to not want GMO food.) The problem is also the reason that foods are being GMO’d. One reason is that food is modified so it can withstand harsher pesticides. When this is done, then the harsher pesticide can be used without killing off the plant but then what does that do to our environment now that we’re using harsher pesticides? Another problem is that the pesticides themselves are being GMO’d. What is that doing to them and how does that worsen their affect on our environment? Do we really want to mess with Mother Nature that way? 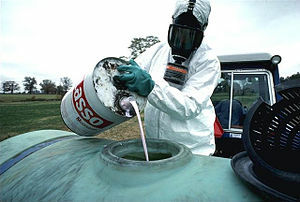 Look at this picture of a guy pouring Monsanto pesticide (Monsanta is very BIG in the GMO business) to be sprayed on food crops. What do the mask, jumpsuit and heavy rubber gloves say to you about the safety of having that in and on our food? And as far as I can see, no one has actually laid out exactly what the effect of GMO food is on our bodies, though the link below does mention GMO pesticides being found in the umbilical cord of pregnant women. Well, you can find pesticides in lots of living things and this is never a good thing and I do my best to avoid exposure to pesticides altogether. The GMO industry is money-driven, of course. And the first step we need to take in order to change the direction of increasing alteration of natural food by genetically modifying them, is to be able to know if a food product is GMO or not. In forty countries, GMO labeling is required. It is not required in my country, the United States. You should find out if it is required in yours. This entry was posted in Food, Government, Health and tagged Food, Genetic engineering, Genetically modified food, GMO, health, Natural foods, pregnancy by mycookinglifebypatty. Bookmark the permalink. You can take action on these sites, contact your representative, email the president, print flyers, sign petitions, and really get involved. Thanks Heather for giving us this information! Yes, the website is http://justlabelit.org/. Thank you so much! I feel it is our responsibility to ensure a safe environment for future generations. Are there any sites or organizations you would recommend to support that lobby to get this kind of labeling passed into law?